Clethra Hummingbird is a deciduous shrub that is native to swampy woodlands, wet marshes, stream banks and seashores, often in sandy soils, along the coast from Maine to Florida and west to Texas. 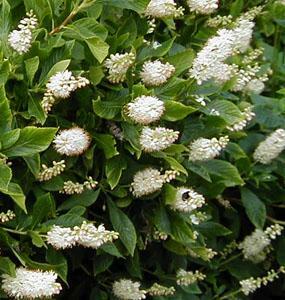 It is a rounded, suckering, densely-branched, deciduous shrub that typically grows to 3-6’ tall and is noted for producing a mid to late summer bloom of sweetly fragrant white flowers which appear in narrow, upright panicles. Flowers give way to dark brown seed capsules which may persist into winter. Mature stems have scaly, dark gray to brown black bark. Glossy dark green leaves turn variable but generally attractive shades of yellow to golden brown in fall. Flowers are very attractive to butterflies and bees. Hummingbird is somewhat unique among flowering shrubs because of its ability to bloom in shady locations in late summer when few other shrubs are in bloom. Mass or group in lawns, foundations or shrub borders. Good flowering shrub for shade or woodland gardens. Effective as a hedge. Also appropriate for moist soils along stream banks or pond/water garden peripheries. Also may be naturalized in cottage gardens, wild gardens or naturalized areas. Plant near a patio to enjoy the fragrant late summer bloom. 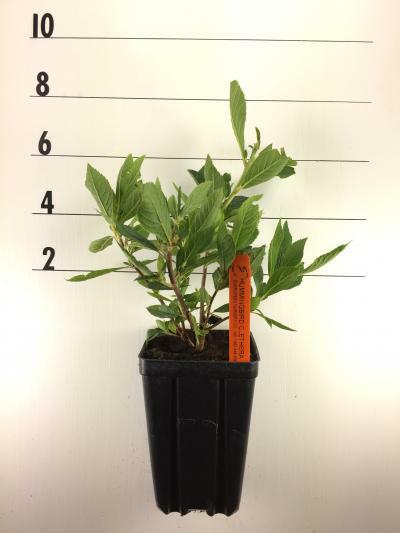 Compact size makes this an ideal flowering shrub for smaller gardens.